Mondays come too fast. Imagine we’re already into the 5th month of the year. Time flies. The 91st theme for #FoodieMonday #Bloghop group was decided by fellow member and blogger Nisa. She asked us to prepare something that will not take more than 20 minutes. With #20minrecipes as the theme, I thought smoothies, salads, energy balls. All these barely take 5-10 minutes. It probably takes longer to gather up the ingredients. I thought one more salad and my group would say ‘oh no not another salad,’. Smoothies ??? No its a bit cold to have them. Did I mention its finally raining? Energy balls… I swear I had some medjool dates but can’t find them in the overstuffed fridge. In Mombasa our fridge is the pantry. We have to put everything from spices, flours to lentils to nuts in the fridge as the hot humid climate spoils these ingredients within weeks. I decided to make Shakshuka (pronounced as shakh-shoo-kah). It doesn’t take much time. It took me 5 minutes to chop the vegetables and then 15 minutes to cook and voila! had a filling, healthy, delicious brunch ready for hubby and me. It is said that originally the dish is from North Africa, more specifically Tunisia. However, its become a popular Middle Eastern dish. Shakshuka is traditionally made with eggs poached in a spice filled tomato and green pepper stew. Nowadays there are so many variations. Since hubby is allergic to bell peppers, I omit them. However, whenever I make this popular dish at home, the veggies that go into it vary. Sometimes I like to give it a Mexican taste by adding cooked corn and kidney beans along with some taco seasoning, or go the Indian way with garam masala and veggies like peas, carrots, green beans and add in cubes of paneer. For today’s post I decided to use mushrooms and spinach. 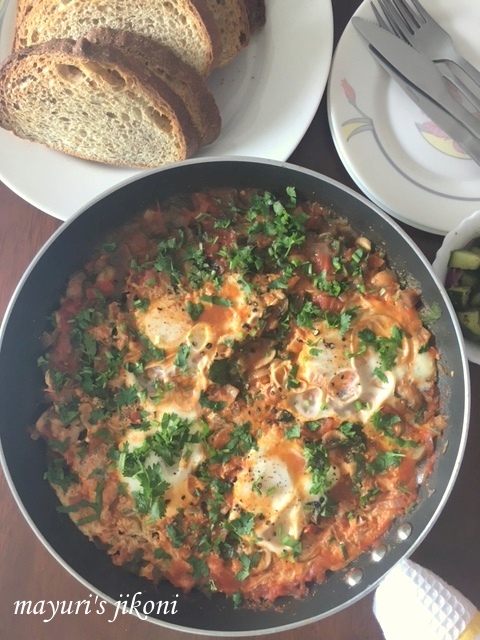 Before you scroll down to the recipe, here is a list of things you could add to the shakshuka to make it into a filling brunch, lunch or dinner. Potatoes, corn, beans, feta cheese, chickpeas, olives, kale, mushrooms, spinach, sausages, bacon, zucchini, eggplants,bell peppers etc. I usually have cooked corn, beans and chickpeas ready in the fridge to add to salads, stew, curry etc. I make my weekly quota of fresh tomato puree.I cut the tomatoes into half, put them in a pan covered over low heat. The tomatoes begin to wilt and the juice comes out. I let it cook for 10 minutes. Remove the excess water/juice and puree the tomatoes to be used for curries, pasta, dals, vegetables…anything that needs fresh tomatoes. I use up the juice/water in lentil stew(dals) or soups. Slice the mushrooms after wiping them with a wet cloth. Heat oil in a skillet or wide frying pan over medium heat. Add onions and garlic and stir fry them till the chopped onion becomes translucent. Add tomatoes and mushrooms. Stir fry for 1 minute. Add the tomato puree, salt, sugar, and all the spice powders. Mix well and cook the stew for 2-3 minutes. Make 4 wells in the gravy. Crack an egg into each ‘well’. Cover the pan and let the shakshuka cook for 10-12 minutes. Serve immediately with pita bread, normal bread slices or with a salad. If you want to add pepper, any colour, chop 1 medium sized one and add it to the pan along with the onions. I did not make the wells properly so as a result the yolk got covered by the egg white. If you are adding any cheese, add it after the eggs are cooked. Add spices, veggies of your choice. Thanks Nisa. I'm sure the family with love it if you add their favourite veggies or meat also. Its like a wholesome meal. Alka, my hubby too loves it. Its become a like a regular meal for us. I bookmarked it for my Mother's Day brunch menu… thanks for such a fabulous recipe…. Loved the addition of the colourful veggies in the Shakshuka. Perfect, quick brunch recipe idea. Eggs are my favorite and this is such an amazing way of making eggs..love middle eastern food. Love eggs in any form.Looks Delish! !